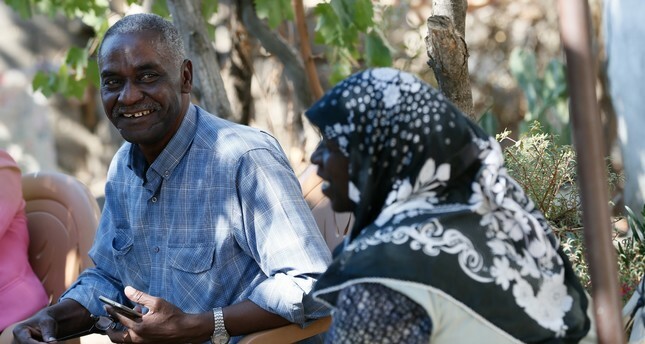 Head of the African Culture and Solidarity Foundation Şakir Doğluer, (L) says his ancestors are reported to have come to Anatolia as agricultural workers or soldiers. The grandchildren of black immigrants who came to Anatolia for various reasons such as agricultural work and military service from African countries in the 1500s continue their lives in some regions of the city such as the Hasköy village of Bayındır district in İzmir province. African descendants, who have been recognized as "Afro-Turks living in İzmir" in time, prefer names like Ayşe, Hatice, Şakir, Mehmet and Ali like a typical Turkish family. When we enter the homes of African descendants living in İzmir, who are now "one of us," the first thing that catches our eye is their clothing. African women smile and welcome their guests wearing headscarves and shalwar. When the conversation begins, their lips are filled with expressions in a Turkish-Aegean dialect. In the kitchens of Afro-Turks, women cook dishes unique to Anatolia. At the humble dining table, foods consisting of "pişi" (a type of pastry), cheese and watermelon, a favorite fruit in Turkey depict the love of these people for Turkey, and they discuss their struggle for education amid poor living conditions. Although many Afro-Turks do not know when, where or why their ancestors came to Anatolia, they consider themselves "Turks" and provide answers to questions about their colored skin in slight reproach. Afro-Turks are not only adding color to the neighborhood where they live but also to urban city life. Mesure Doğan, who is illiterate but knows all the streets of the historical Kemeraltı Bazaar "inch by inch," holds onto life with "the struggle to make a living," while Yalçın Yanık, who tries to earn his livelihood by stitching together pieces of leather, with "the happiness of being the center of attention," finds comfort in his fellow traders. Güngör Delibaş, whose family is originally from Sudan, said she left her family for the love of her life in Turkey decades ago. Expressing that she recently lost her husband to illness, Delibaş said: "I am originally from Sudan. My family did not send me to school. I fell in love with my neighbor's son, and then I ran away. I could not go back to the village for years because of fear, but I did not give up on my love," Delibaş said. "Love does not care about beauty, wealth, or skin color. Ours was true love. Not everyone can find such love. My mother has not forgiven me for running away and she has not spoken to me for 45 years. I was happy, my mother was not." Hatice Doğuşer said she has no idea where her ancestors came from but stressed that she spent her childhood by working in the cotton fields. "I could not go to school and say, 'I will become this.' I wish everything was fine, but I knew they would not be. The villagers did not alienate me. When I go out of the village, there are people who call me 'Arab,' and I get angry at them," Doğuşer said. Sabriye Sınaic also highlighted that she considers herself a Turk, and that her son-in-law is also from İzmir. "My son also started a family with a white girl. My grandchildren are a mixed race. Everyone gets married to whomever they want," Sınaiç said, adding that they are pleased with their lives in İzmir while expressing that she is also curious about their relatives in Africa. "If I had the chance, I would like to see the land my ancestors came from. Turkey will always be my homeland because I love it very much." Serkan Doğuluer noted that he has generally earned a living through farming. "Being an Afro-Turk is both enjoyable and difficult," he said. "Sometimes, people do not believe that we are Turks. There are those who ask to see my identity card, take photos and speak English. In the past, I have experienced job-related problems as well." Mesure Doğan, 70, who is illiterate and makes a living on selling products such as slippers and fabrics bought from the historical Kemeraltı Bazaar, said she lost her father at a young age. "I got married, had no children and my husband died. Now, I only have God and my siblings here. I sell what I buy from Kemeraltı in the small villages. Sometimes in Kemeraltı, people call me 'Arab.'" Yalçın Yanık, 58, a leather-maker in Basmane, said his ancestors came to the region as slaves, adding however, that "I have not seen any discrimination in Turkey. I have not experienced any difficulty in urban life as an African. To the contrary, the interest has been more intense," he added. Şakir Doğuluer, the leader of the African Culture and Solidarity Foundation, said they try to learn more about the culture of their ancestors. Doğuluer stated that his ancestors are reported to have come to Anatolia as agricultural workers or soldiers. "We think that there are around 20,000 to 25,000 Afro-Turks in Turkey. Since we are warm-hearted, we have no problem where we live. There are many people in İzmir that like us. We were born and raised here," Doğuluer said, adding: "My father did military service for this country. Some of our ancestors fought in the war in Çanakkale. This is our country, we are also in this country. Our traces in the past have disappeared. I wish we could find our roots, but it is very difficult." Dr. Umut Cafer Karadoğan, a professor of Sinop University's Department of History who has studied Afro-Turks, said people of African origin were brought from Ethiopia, Eritrea, Sudan, Libya and Egypt to Ottoman lands since 1510 to serve as servants in the palace. Informing that African descents were "freed" because of the lack of "slave" status in Islam and asserting that some of them were placed in İzmir, Aydın, Muğla, Antalya and Northern Cyprus and given the status of agricultural worker, Karadoğan said during the Period of Stagnation, especially between 1650-1700, they were brought up as soldiers. Umut Cafer Karadoğan noted that orphaned children of African origin were also adopted. Pointing out that African descents began to act as they wished upon the development of the concept of citizenship after the Tanzimat period, Karadoğan said, "African descents are also having interracial marriages, and their colors are gradually whitening. Yet, they still do not know their identity."